Curb Records will release the soundtrack to The Last Ride, an new, independent film inspired by the life and death of Hank Williams. Starring Henry Thomas, Jesse James, Fred Thompson, and Kaley Cuoco, The Last Ride is a fictionalized account of a period of Williams’ life when he was sobering from alcohol and drugs and trying to get his career back on track. In late 1952, he scheduled several New Year’s shows in West Virginia and Ohio but passed away on New Year’s Day in 1953 in the back of his Cadillac. The soundtrack contains some of Williams’ best known songs as well as new selections written for the project. Performers include Williams’ daughter Jett Williams, Johnny Cash, The Isaacs and more. 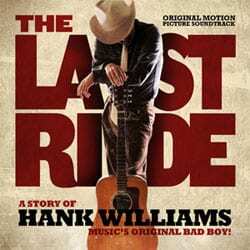 The Last Ride will be released in selected theaters in June. A few Nashville fans got to see a special screening of the movie on Saturday (5/26) at Ernest Tubb Texas Troubadour Theater.